Includes vanity with sink, mirror, soap and paper towels. Fully stocked with soap, paper towels, toilet paper and water for the sink. 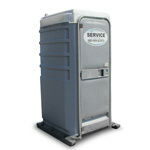 * Please call us with any questions about our portable restroom w/sink deluxe in South Chicago Heights IL and Highland IN.